Monk's Cellar: Be Not Afraid - Sr. Elizabeth Marie, O.P. BE NOT AFRAID. CHRIST IS RISEN. Don't miss a very special Easter edition of Monk's Cellar as we welcome Sr. Elizabeth Marie and Sr. Perpetua of the Nashville Dominicans. "Do not be afraid" - God assures his people throughout Scripture. Yet we are so often paralyzed by fear. What's worse, we are not only afraid of things that are "bad and scary," but Divine. All too often, we are afraid of healing, of mercy, of God. Like Adam in the Garden, we hide in fear. Easter is the time to come out of hiding. The Resurrection of Jesus, above all, offers assurance that, before God, we need not be afraid. After a presentation, Sr. Elizabeth Marie and Sr. Perpetua will be present for a Q & A session where no question is off limits. A very special thanks to our friends at the Monk's Cellar. You buying dinner is the best way to thank them for their hospitality. As always, anybody age 18-39, Catholic or not, is welcome to attend. Free beer to those over 21 sponsored by St. Joseph Morello Parish starts at 7. The events always fill up, so come early for a seat. Sr. Elizabeth Marie entered the Dominican Sisters of St. Cecilia of Nashville, TN in 2004 and made her final vows in 2011. She grew up in a small town in Wisconsin, and she still loves the Green Bay Packers. She attended the University of St. Thomas in St. Paul, Minnesota, where she received degrees in philosophy and Catholic Studies. 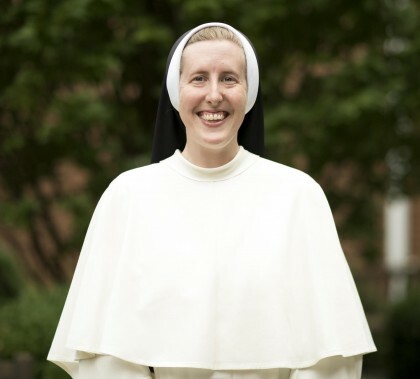 Since becoming a Dominican Sister, she has taught various grades in four different states. Most recently she was teaching bioethics to high school seniors in Birmingham, AL. She is currently assigned to assist in the Vocation Office of her Congregation, affording her the opportunity to travel and share with others the Good News of Jesus Christ and the call to follow Him through religious life.